Fulfillment Lists are used to provide lists of contacts who have done something, such as listing those who have purchased a product. 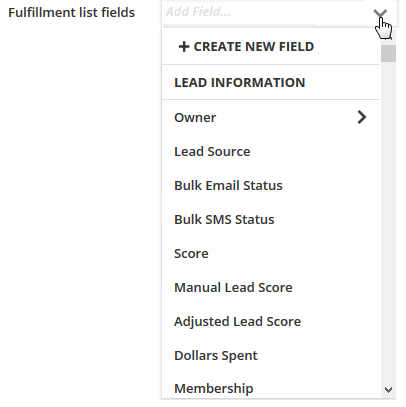 Fulfillment Lists can be used for any action or condition your Contacts achieve, so you can use them for lists of new leads, contacts who have purchased products, reporting sales information, listing Contacts who have their Bulk Email Status changed or any other reason you'd like a list of contacts who have achieved a certain action. ONTRAPORT will email the Fulfillment Lists to any email addresses you specify daily, only on weekdays, weekly, or monthly. All of the Contact Record fields are exposed to the list, and you can include as many as you like. The Fulfillment List is a CSV file that can be imported into Excel, or into other systems. You can specify that a Contact remain on the Fulfillment List forever, or be removed after the list is compiled and emailed. We recommend adding or removing Contacts to the Fulfillment List by using a Campaign. You can also use Legacy and Advanced features by adding a rule on a form, a Rule Step in a Step Sequence, or a global Rule. Note: Fulfillment Lists under 2 MB are sent as file attachments. If the Fulfillment List is over 2 MB a download link is provided instead. If you would prefer that all Fulfillment List emails contain download links please contact support@ontraport.com. Go to Campaigns. Create a new Campaign or edit an existing one. 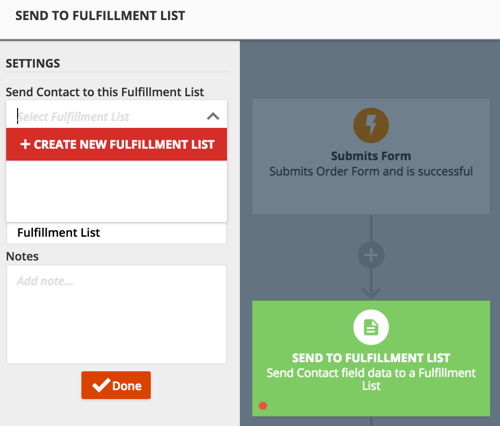 Add a Send to Fulfillment List action step where you'd like. Select the checkbox to unsubscribe contacts after sending. Leave it unchecked to have them on the list indefinitely. For example, if you wanted to a cumulative list of contacts who will attend your event, leave this box unchecked. To delete or modify Fulfillment lists, visit the Fulfillment Manager. Select the checkbox to unsubscribe contacts after sending. Leave it unchecked to have them on the list indefinitely. If you would like to remove contacts from a Fulfillment List, we recommend using a Campaign via the "Remove From Fulfillment List" Action. Global Rules and Rule Steps in Sequences can remove a Contact from a single or all fulfillment lists as well. Hi, just wondering what the numerical value in the "Subscribers" column means.